Video discovery startup Taboola has been growing fast, adding top publishing partners like BusinessWeek and The Washington Post, as well as expanding into the live streaming video vertical. Those new partners have helped drive growth for Taboola, which now reaches more than 100 million uniques a month. According to data from Quantcast, Taboola has reach of more than 110 million unique visitors a month. Of those viewers, more than 65 million are in the U.S. alone. As a result, Taboola generates more than 300 million recommendations every day, CEO and founder Adam Singolda told me by email. While Taboola, which provides a widget for recommended videos, has traditionally been used by news publishers like the New York Times who are trying to expand their available video inventory and advertising revenues, it’s been tapped by two new partners in the live streaming vertical. Ustream and Major League Gaming now both make Taboola recommendations available to their viewers. With the move to provide recommendations for live streaming viewers, Taboola has had to add capabilities beyond just the contextual targeting that it typically uses to match up video recommendations for users. Because videos are live, the recommendations engine doesn’t have as much data to go on. So Taboola is providing recommendations based on behavioral targeting while viewers are watching live streams. Outside of the live video market, Taboola has also added new partners. Those include BusinessWeek, The Washington Post, Food Network, The Hollywood Reporter, Daily Caller, Ask Men and Gannett’s Navy Times. 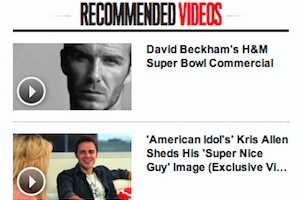 With some of those publishers, the Taboola video widget is on every page of their websites. As publishers try to expand their use of video, they need ways to highlight the content that they’ve produced. Taboola can not only provide recommendations, but can also expand the amount of video available to viewers by recommending those from other publishers and sharing revenues between them.